The \(k\)-colouring reconfiguration problem asks whether, for a given graph \(G\), two proper \(k\)-colourings \(\alpha \) and \(\beta \) of \(G\), and a positive integer \(\ell \), there exists a sequence of at most \(\ell \) proper \(k\)-colourings of \(G\) which starts with \(\alpha \) and ends with \(\beta \) and where successive colourings in the sequence differ on exactly one vertex of \(G\). 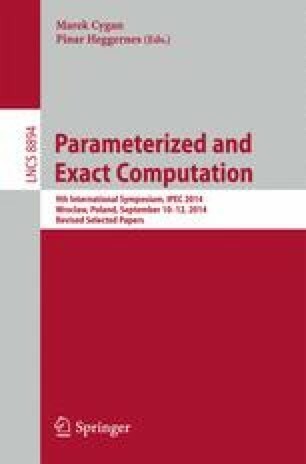 We give a complete picture of the parameterized complexity of the \(k\)-colouring reconfiguration problem for each fixed \(k\) when parameterized by \(\ell \). First we show that the \(k\)-colouring reconfiguration problem is polynomial-time solvable for \(k=3\), settling an open problem of Cereceda, van den Heuvel and Johnson. Then, for all \(k \ge 4\), we show that the \(k\)-colouring reconfiguration problem, when parameterized by \(\ell \), is fixed-parameter tractable (addressing a question of Mouawad, Nishimura, Raman, Simjour and Suzuki) but that it has no polynomial kernel unless the polynomial hierarchy collapses. Supported by EPSRC (EP/G043434/1), by a Scheme 7 grant from the London Mathematical Society, and by the German Research Foundation (KR 4286/1). We are grateful to several reviewers for insightful comments that greatly improved our presentation.